Embedded instruction is an approach used to promote child engagement, learning, and independence in everyday activities, routines, and transitions. This is accomplished by identifying times and activities when instructional procedures designed for teaching a child’s priority learning targets are implemented in the context of ongoing [naturally-occurring] activities, routines, and transitions in the classroom. 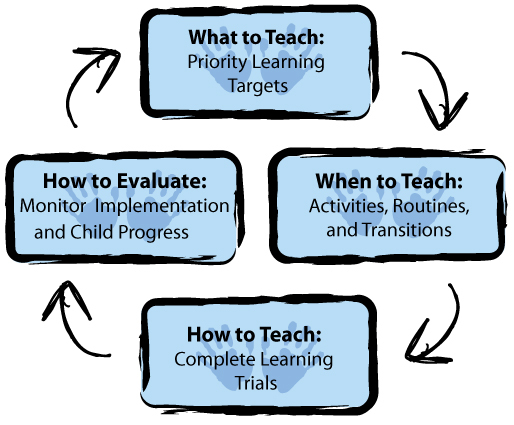 This approach to embedded instruction emphasizes the use of complete learning trials to ensure sufficient, systematic, and intentional learning opportunities are provided in the context of everyday activities, routines, and transitions. Our definition also focuses on identifying the types of instructional procedures that might be used within or across these activities, routines, and transitions. Embedded instruction is used to meet children’s needs without changing daily routines and activities by providing opportunities to learn and practice important skills in meaningful contexts. Instruction can occur during natural classroom activities, routines, and transitions using curriculum for all children. Embedded instruction maximizes children’s motivation by following their interests and promotes generalization and maintenance by providing instruction within and across activities, routines, and transitions. What are the embedded instruction practices? Embedded Instruction for Early Learning focuses on key practices for planning, implementing, and evaluating embedded instruction. The practices are organized under the headings of what to teach, when to teach, how to teach, and how to evaluate.